That's a short "8 shaped" track found buried in the Re-Volt's source code files. It's geometry was stored inside a folder named 'BLOCKS', with a name of 'MINI010.MAX'. I don't think it is a real track. Maybe it's just a random model they made, as several other block pieces from that folder. 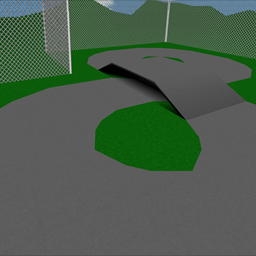 Even so, I converted this into the game and turned it into a raceable track. Credits for the visible geometry (excluding fences and mounds) goes to the game creators.